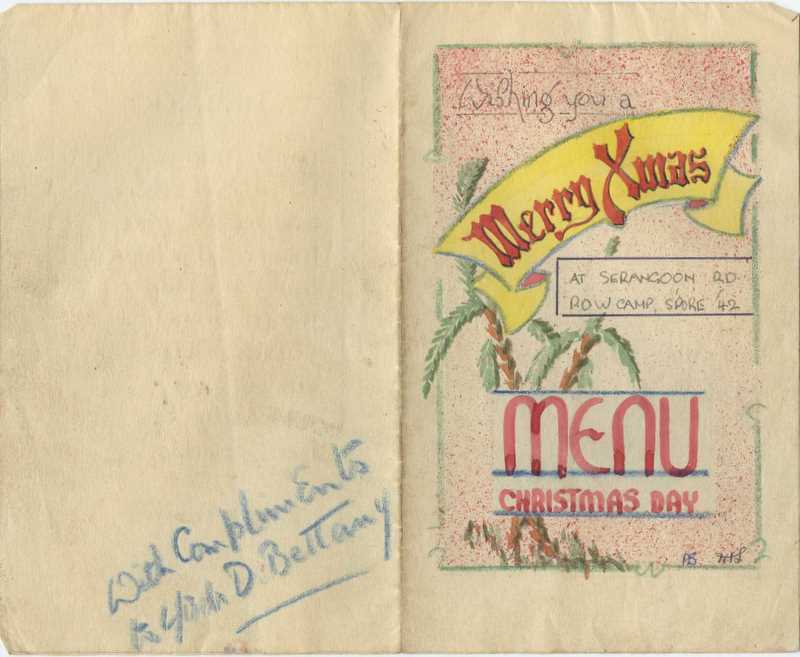 (Christmas 1942) ‘Our meals throughout the day were most attractive. For the first time we were able to drink coffee with tinned milk, a luxury, and breakfast was made more exciting by some fish fried with chipped potatoes, followed by a Carol Service completed with services for the day. In the evening we ate a most superior dinner. Ten scraggy cockerels carefully nursed for months provided the ‘plat du jour’, preceded by soup and followed by a fair imitation of plum pudding. It was the right colour and had dates in it. We drank home brewed pineapple cyder, though the word ‘cyder’ makes it sound more potent than it really was, but in the hackneyed words of those local newspaper reports – ‘a good time was had by all’. Source: Down To Bedrock (the diary & secret notes of a Far East prisoner of war Chaplain) by Eric Cordingly, Pg 93; permission by Louis Reynolds, daughter. ‘In the kitchen the cooks are making heroic efforts to provide Christmas dinner. The meal is amazing but the food is the same. Rice always tastes much like rice, leaves much like leaves, sun – dried fish like sun – dried fish. 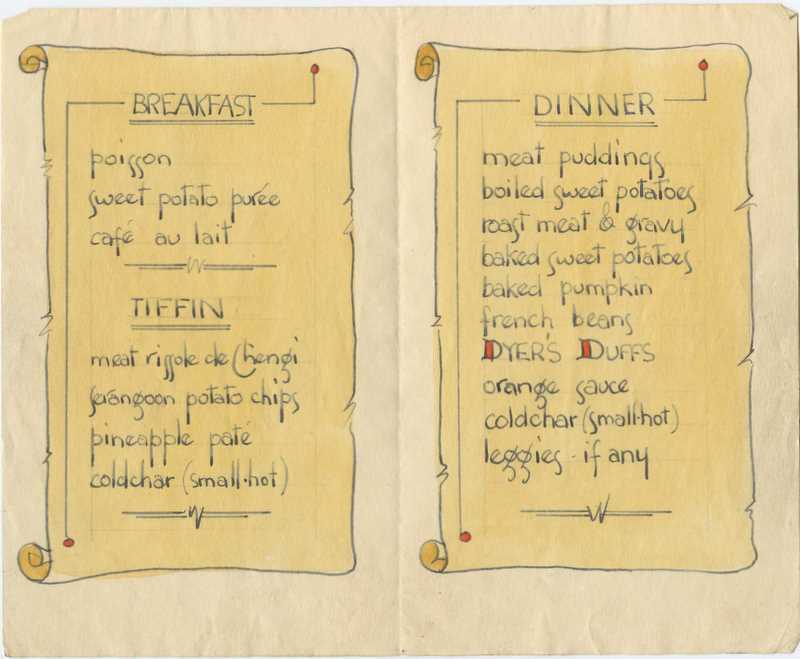 The titles on the menu – Changi plum pudding with sweet sauce, mixed grill of vegetables with gravy, fish rissoles, tea with sugar – these do not deceive the diners. Yet they are happy and eat with gusto. The meal, the day, the camp; all has been blessed with the indefinable thing – the spirit of Christmas, a product of the human consciousness more potent, more real when divorced from its commercialisation and trappings.